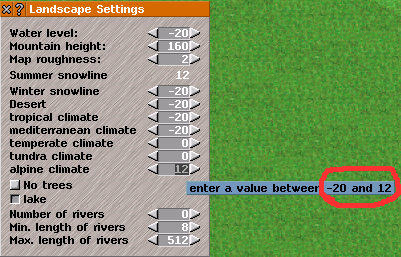 In "Lanscape Settings" dialog the minimum range for water level is -20 and the minimum range for climates is -5. I think these values should be equal (-20), otherwise I cannot create proper climates for certain maps derived from heightmaps with many levels of altitude. 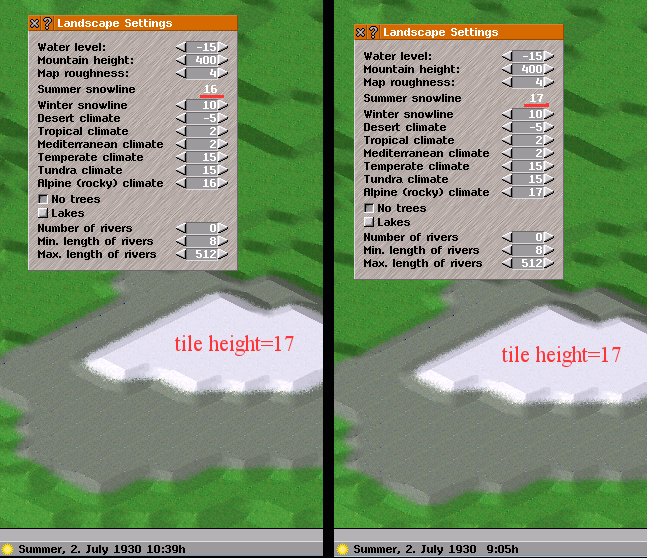 otherwise I cannot create proper climates for certain maps derived from heightmaps with many levels of altitude. You can, although it's tricky. Instead of the landscape settings dialog, open the normal settings dialog, change to the landscape tab and change your water level to -20. Then close these settings, open them again, and you are able to use -20 for climate settings. Of course, it's still a bug. Just noting how you can circumvent it until it gets fixed. In the landscape tab water level cannot be set below -10. Then you are using a set with single ground heights. Check next nightly please. It's actually true for half-height sets as well. You can set it to -20 in the landscape settings, but there you can only set -5 in the climates. If you open the landscape tab in the settings, it reverts to -10. However, since it was -20 when the tab was opened, you can now set the climates to -20 to have them only in the netherlands. So both climates at -20 and waterlevel -20 are possible, just not together. It would probably be much easier to maintain if the landscape settings dialog was removed, and the button for it would lead straight to the landscape settings tab. There, you'd only have to fix the range to allow for -20 in everything, and remove the weird "no lower than water level" restriction. Why this is weird? Any land below the water level is turned to water on map creation. Also in order to prevent drawing errors, the highest climates should not be more than 32 levels above the lowest (the water line). It's weird because that's not how it currently works. Unexpecting players might open the window, set the water level lower, and wonder why climates can't go down to water level. Removing the limit would at least fix the first situation, while the second stays the same - so over all, it would be an improvement. Of course, if there is an intended range of waterlevel to waterlevel+32, it might be best to restrict those boxes to a range from 0 to 32 and just add the waterlevel before generation - pretty much the way it used to be. 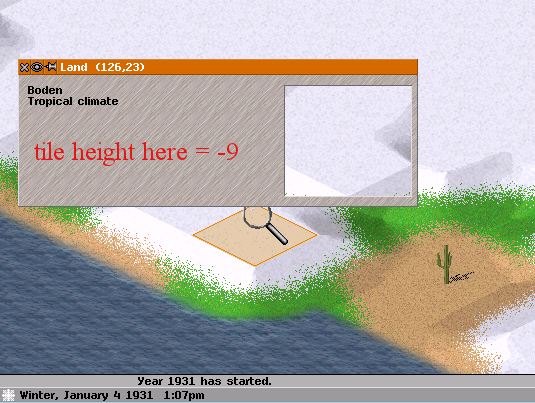 It works after changing water level, then it is updated on the climate dialoge. The initial updating was missing, will be fixed soon. Original bug fixed in r8385. But another one surfaced (related). Alpine climate range should be 0..32, regardless of water level settings. This is because alpine climate range is already displayed relative to water level (as intended probably). Now, as a result of this new bug, on maps with low water level I get arctic climate (summer snow) almost everywhere (even on max serttings). For example, a water level -20 enforces arctic climate (summer snow) from level (-20+12)+1=-7 on max settings, which is just 13 levels above water. Also, water level goes now up to -40! A feature? Tss.. someone's been watching too much Pacific Rim, yo! The (new) bug still not fixed in r8387. As I mentioned previously, in climate dialog the range for alpine (and implicit arctic) climate is relative to water level, but the range for lower climates are in absolute tiles height. I think this is the source of the bug. An example is given 3 posts above. In the code the artic climate is absolute, not relative, so the same limits should apply for everything. OK, but snow coverage appears too low on map then. See below. Both snow levels should be 10 tiles higher. I think that snow coverage is displayed on map relative to water level. So, we still have a bug here (r8388). In climates.cc lines 241--252 there are two nested for loops, both working on the variable i. I do not know what the code is intended to do. The inner loop was useless (after being copied from the top) but it did not do any harm too. The error is in simworld, where to the summer line (despite being absolute) the groundwater is added again. Not sure how to fix this, because it will affect the snow in all old games. The best that can be done is to correct the summer snowline upon loading, and live with the now correct (but likely higher) winter snowline. Having snow at lower elevations than expected is missleading for the player. I thought that arctic climate is relative to water level just because of that. I hope some sort of fix is implemented, at least for summer snowlines. Currently maps with low water levels are "compromised" with too much snow. In r8408 the artic climate is now converted upon loading/saving in older games to give the correct value without adding the groundwater. I confirm snowlines are now at absolute levels (r8410). But, there is a small remnant bug when pushing summer snowline to maximum (32 levels above water). In spite of changing summer snowline from level 16 to 17 nothing changes on map, i.e. arctic climate begins at level 17 in both cases. Water level set to -15. I think the later is wrong. Summer snowline is clipped at 32 levels above water, no matter how high I set alpine climate (r8411). Is this the intended behaviour? 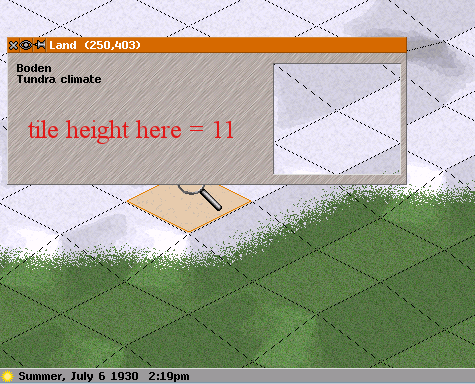 There are other errors at heights larger than 33 (like no cursor) but at least the climates will be generated as desired. This is fantastic! Now we have a very flexible and more robust climate system. Thank you. There are other errors at heights larger than 33 (like no cursor). This is not a big problem for heightmaps, since I can set black color (0,0,0) in the image to be the lowest ground level on the map (water_level = -34 for this), and I have 64 usable height levels. Pretty impresive. On another hand, before fixing these bugs it was possible to have snowy shores around water by setting winter snowline below water level. A very nice effect! After recent bug fixes this trick does not work anymore, because winter snowline cannot be set below water level. May I suggest to allow the minimum range of winter snowline to be one level below water level? This will do the trick again. I somehow managed to get alpine climate on beaches without changing the climate borders to extreme values. Could not reproduce. I played quite a lot with the new climate system in pak128, but I didn't notice anything weird.